This is an In Person Signed Black and White 10" x 8" reproduction Photo of the late Swiss Formula 1 Driver who was paralyzed from the waist down in a Race accident and was killed in a car accident in Italy in 2006 where he was commentating for Italian T.V. Gianclaudio Giuseppe "Clay" Regazzoni (5 September 1939 – 15 December 2006) was a Swiss racing car driver. He competed in Formula One races from 1970 to 1980, winning five Grands Prix. His first win was the Italian Grand Prix at Monza in his debut season, driving for Ferrari. He remained with the Italian team until 1972. 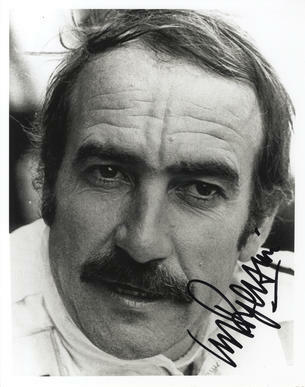 After a single season with BRM, Regazzoni returned to Ferrari for a further three years, 1974 to 1976. After finally leaving Ferrari at the end of 1976, Regazzoni joined the Ensign and Shadowteams, before moving to Williams in 1979, where he took the British team's first ever Grand Prix victory, the 1979 British Grand Prix at Silverstone. He died in a car accident in Italy on 15 December 2006.